Originating in the Caucasus mountains of Russia, Comfrey can withstand temperatures of -40° F below zero without winter kill. It thrives in Africa in 120° F heat and with 12 cuttings per year there, they hold the world record yield of over 140 tons per acre. Comfrey can be planted spring, summer or fall, anytime the soil can be worked. In warmer climates (Deep South and Southwest USA), it can be planted and the leaves harvested throughout the year. Comfrey grows best in USDA Hardiness Zones 3-9. But will grow almost anywhere. Comfrey prefers a sweet soil with a pH of 6.0-7.0 and grows best in rich, moist soil in full sun, but will tolerate some shade. * It will grow well in clay, light sands or loams — whether in dry or wet areas. Strong growing and deep- rooted, Comfrey adapts well to most any environment. *An ideal range of sunlight exposure is between 4 to 6 hours. Afternoon shade of some form will still be useful, as any more than six hours can potentially cook the plants, particularly in states/areas with high spring/summer temperatures. Because the Bocking #4 is so deep rooted, it will thrive in drought where most other plants are helpless. We do not sell the Bocking #14 strain of Comfrey as “it is shallow rooted and subject to drought,” and “it is disliked by rabbits and chickens — as being too bitter” according to Lawrence D. Hills, the world’s foremost expert on Comfrey. Plant Comfrey in “fertile holes” to get established and it will thrive and live even through the hottest Summer or coldest Winter. Comfrey needs a 3 foot spacing for proper root development and highest yields. Strong, mature plants on a 3 foot grid will have the larger outside leaves touching the adjacent plants after 4 to 5 weeks growth. Comfrey can also be grown indoors, in pots (1 to 5 gallon size) for a continuous harvest of fresh, small leaves. For this purpose best results are obtained by planting two-year or 3-to-4-year plants in the larger pots or 5- gallon buckets. Plant crowns or plants NOW and have fresh leaves in two to three weeks! Comfrey roots can grow down 8 to 10 feet and out to a 3-foot radius bringing up minerals and nutrients that have leached down for thousands of years. Comfrey is a “dynamic accumulator”— each plant a super “nutrient-pump”— producing versatile, valuable leaves — year after year. Comfrey leaves can grow to be 10” wide x 20” long with prominent veining and some soft bristles underneath. The top side appears smooth. The smallest leaves are slightly fuzzy and all leaves are tender. Large strong plants become a “fountain of leaves” comprised of 15 to 25 shoots and leaves, small to large, coming right out of the ground. The plants can be 2½ feet high by 2½ feet in diameter every month of the growing and harvesting season. 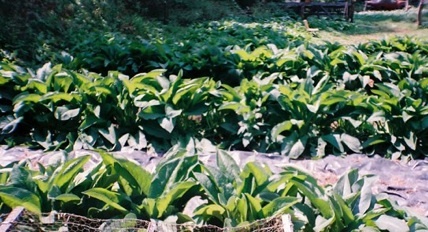 Comfrey begins its growth early in the Spring; the first cutting here in Nantahala, NC (3400’ elevation) is in mid-April and the stronger plants will be in the “fountain of leaves” stage. This growth should be cut off 2“ above the ground and as needed throughout the growing season. These fast growing leaves can be cut 3 to 8 times a year with each plant yielding 3 to 8 pounds per cutting. Comfrey produces a small yield the first year, a larger yield the second year and comes into full production in the third season. Plants will continue producing leaves for 25 years or more and with optimum conditions you will reap thousands of pounds of nutrient-rich leaves from each plant. For best results: Keep your comfrey plantings CLEAN (free of weeds and grass), CUT (monthly cuts bring on new growth) and FED (use organic fertilizers such as manure). In Permaculture, comfrey is often left to grow around trees without cutting. The larger outer leaves will lay down forming a nutrient-rich mulch and ground cover. Leaves can also be cut and scattered around the orchard. 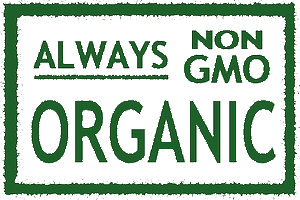 However to obtain the highest yield as a crop, it should be kept free of competition from grass, weeds, and tree roots. The plants are then cut when at peak growth and manured. NOTE: When planting root cuttings OR crown cuttings (laid flat) in a more dense, clayey soil and during cold Fall or Spring time, plant about 1½” to 2” deep. In sandy soil when it’s hot Summer, plant deeper — 3” to 4” deep. Water well and keep the soil moist. Use mulch (if available), but add extra nitrogen (as in manure, urine, etc). 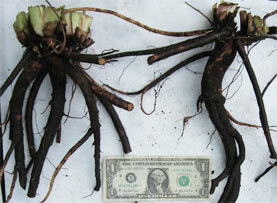 Root cuttings are sections of lateral roots and are 2” to 6” long depending on the diameter. They develop buds 20 to 40 days after planting, and are best planted in beds, rows, or pots, and transplanted to permanent locations when a year or more old. Roots are laid flat and covered with 1½“ to 4” of soil when planted (see NOTE above). 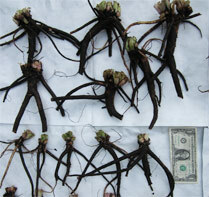 Root cuttings take 1½ to 2 years to grow to the size of a one-year plant. Crown cuttings will make a large one-year plant in 1 to 1½ years. One year plants will reach full maturity in 3- to 4- years. Large fields are planted using root cuttings or crown cuttings, the ground being prepared as when planting corn or potatoes. On large, mechanized farms it is set on a 4 foot grid, to allow room for machinery to cultivate between the plants. Large machinery is used for soil preparation and then frequent, but shallow cultivation. Keeping all grasses and weeds down is necessary to allow the plants to get established. After the plants have become established, cultivation can be reduced to 3 or 4 times per year. Comfrey can be planted as close as 18” apart in rows if intensive cutting of small leaves is desired. Manure, and also a mixture of commercial fertilizer composted with manure, is used on some of these large plantings. This mixture has worked very well for those wishing to use artificial, commercial fertilizers, however you will have very poor results with artificials used alone. In the Spring of the third year, you can seed white Dutch clover or Ladino clover throughout the planting. The clover will help provide nitrogen and keep the leaves clean. Raw mineral bearing rock dust is applied as fertilizer for the clover and Comfrey, This is broadcast one-half ton per acre, per year. Aged manure is applied at the rate of one bushel in the Spring and one-half bushel after the second cut is removed, per plant. This is dumped directly onto the plant itself. The Comfrey quickly grows up through the manure. “Raw and crude” chicken manure can also be used once the plants have a strong root system; in three years or more. Large plantings using thousands of root cuttings (4,840 per acre on a 3-foot grid) require different methods and equipment. On a small-garden or homestead scale using crown cuttings or plants, it is best to use prepared holes. For roots, simply make furrows 2 to 4 inches deep and lay root cuttings in them spaced about 8 inches apart, to get them started growing into plants. A bed can be set with root cuttings spaced 8 inches all over it (see NOTE above for depth). Transplant to permanent location in a year or so. Also soil-filled one-gallon pots can be massed together, set on plastic, and a crown cutting or root cutting set in them. The pots are easily watered/fertilized and can be transplanted, transported or sold at any stage. The plastic on the ground prevents the roots from penetrating the soil. Plants in pots are subject to winter kill unless pots are protected with mulch, etc. Crown cuttings and what we call “offsets” are cut sections and new growths respectively, from old mature plants; usually 5 to 25 years old. They are the same grade of planting stock, are interchangeable as to size and quality, and are sold as the same Item, namely Crown cuttings. They are a body 3” or more in length with sprouts or shoots at one end. When planted they are laid flat or placed with the sprouted end up just above the soil surface or covered with 1½ to 4 inches of soil (see NOTE above). Crown cuttings and offsets already have sprouted buds or “growing points” and should have visible top growth 2 to 8 days after planting. One-year old plants have a body with crown and some roots. They are obtained by setting crown cuttings and allowing them to grow for a season/year. When planted they are set in their natural growing position. The green sprouting parts are leaf shoots and this top is placed with the sprouted end up just above the soil surface or covered with as much as two inches of soil. Firm the soil around the roots. Crown cuttings and 1-year plants are best set in permanent locations, 2½ to 3 feet apart. However, planted on a 2- foot grid they will totally shade the ground keeping out all weeds and grass. The highest yield and optimum root development is obtained with the 3-foot grid spacing. Remember --- Plant Crowns or Plants NOW, Have Fresh Leaves in Two to Three Weeks! Two-year old plants produce fast growth, being much stronger than younger planting stock. These are best when you need some strong and quick-growing leaf producers. Three-to-four year old plants are the very best for producing a lot of leaves fast. These and the two-year plants are used for the “fountain of leaves”, indoors or out. They look great as an ornamental planted in groups of three. Black plastic sheeting (6 mil) can be rolled out over plantings on 2- to 3- foot grids made on level ground. Holes are cut out in the plastic to allow growth of the Comfrey. Fertile holes are best used with this technique and plants can be fed later with liquid manure/urine. The plastic keeps all grass and weeds out and holds moisture in. This method is to simply dig a hole for each plant on a 3- to 4 foot grid or 2- to 3 feet apart in a row system. Fill the hole half to 2/3 full with aged manure of any kind, and fill in the rest with good garden/top soil. Add dolomitic limestone powder if your soil is acidic; Comfrey prefers a sweet soil — 6.0 to 7.0 pH. Fill hole to ground level, blend and mix well with a narrow shovel. Soak with water, set a plant or crown cutting to correct depth, then firm the soil. That’s it! Generally, 1-gallon volume holes are dug for crown cuttings, 2 to 3 gallon holes for one-year plants, and up to 4 or 5 gallon holes for two-year and 3-to-4 year-old plants. We have used a two-man power auger, digging holes 2½ to 3 feet deep and 10 inch diameter. They are enriched as mentioned above, then plants are set. The fertile holes get the Comfrey “super-charged” and quickly sending roots down and shooting leaves up. However, Comfrey will grow if simply put in shallow holes with some manure dug in later. Here it is best said, “Sow sparingly and you will reap sparingly”. The best long-term results come from digging the holes large and adding a variety of soil amendments (Azomite trace minerals, rock phosphate, green sand, high nitrogen manure, compost, rich barnyard soil, etc.) It’s hard to overdo it when adding these soil amendments as they will feed the plant for many years into the future. Comfrey can stand higher levels of nitrogen in manure than any other plant on Earth. Plant plenty of these "nutrient pumps" and behold the yield! “Sow bountifully and you will reap bountifully”.